Fergusons Bridge is a four-span composite timber and steel road bridge with graceful curving timber deck, situated on the Bendigo-Murchison Road over the Campaspe River, approximately 4 kilometres east of the Midland Highway. It utilises rolled-steel joists seated upon conventional driven-pile timber piers, and features a rare super-elevated curved timber deck 56 metres long and 7.1 metres wide. Span lengths between timber piers average 13.8 metres. It was constructed by the Country Roads Board in 1939. It is situated on the farming plains of northern Victoria, among large red river gums on a spacious river bank reserve along the Campaspe River. It is currently in regular use as a VicRoads Main Road bridge. Fergusons Bridge is of scientific (technical) and historical significance to Victoria. Fergusons Bridge is of scientific (technical) significance as a very rare curved-deck timber and steel road-over-river bridge representative of the post-Depression/pre-World War 2 era of Victorian transport history when rapidly increasing numbers of motor vehicles forced road authorities to abandon traditional bridge designs more suitable to horse-drawn vehicles. Before the beginning of the motor era timber bridges were, almost without exception, built at right angles to the stream, often involving a sharp change of direction between the road and the bridge. During the 1920s and 1930s, the CRB increasingly built timber bridges on skew alignments to cater for faster-moving motor vehicles and in a few instances even built timber-decked bridges on a curved alignment. By the Second World War super-elevated bridge designs had been introduced, providing banking of the deck surface to counteract the centrifugal force on turning vehicles, however the combination of super-elevation with a curved timber deck remained quite rare. Ferguson’s Bridge is the oldest surviving example of a timber curved and super-elevated bridge in Victoria. Very few curved and super-elevated composite road bridges with timber decks appear ever to have existed in this State; the only three other known surviving examples have been substantially rebuilt. Of four spans, with a deck width of 7.1 metres and a maximum span of 13.8 metres, it is of above average size for a composite steel and timber bridge. Fegusons Bridge is of historical significance for its association with the site of an early Campaspe River crossing place adjacent to the Pre-emptive Right (homestead site) of Robertson’s ‘Campaspie River’ squatting run in the earliest days of white settlement. In 1881 the early pioneers’ ford was replaced by an all-timber low-level river bridge named Ferguson’s Bridge, which in turn was replaced by the present 'modern' timber and steel structure in 1939. The overland route between Violet Town and Bendigo, via Murchison and Rushworth, was one of Victoria’s busiest gold-era roads, connecting the bustling central goldfields area with the Beechworth-Chiltern goldfields and ultimately with New South Wales goldfields. 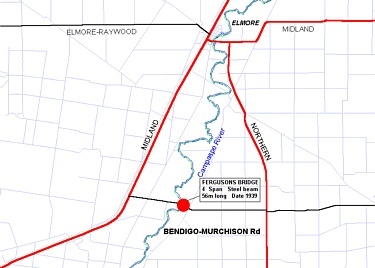 However, the current section of the Bendigo-Murchison Road where it crosses the Campaspe River close to the Midland Highway junction, does not appear to have been part of the goldfields route. That gold-era route appears to have diverged once west of Rushworth, passing slightly south of the present road to the early Campaspe River crossing place at Clare Inn or Barnadown. While it is not known exactly when that first Clare Inn Bridge over the Campaspe was built linking Rushworth with Bendigo, it was certainly in existence by 1873 when correspondence from Waranga Shire to the Public Works Department asked ‘that the east side of Clare Inn Bridge may be reserved for water purposes’. The current route of the Bendigo-Murchison Road at Ferguson’s crossing appears to have been a lesser road served by a ford until the first Ferguson’s Bridge was constructed in 1881. At the beginning of 1882 the Waranga Shire was requested ‘to erect a pump at the ford over the river, near Mr Ferguson’s, for the use of the ratepayers’. This strongly suggests that Ferguson’s crossing on the Campaspe River had previously been served by a ford, and that the 1881 timber structure first known as Ferguson’s Bridge was the original bridge to be built over the Campaspe River on the current Bendigo-Murchison route. The Waranga Chronicle in November 1880 published a series of tender advertisements for pending Waranga Shire road and bridge works: ‘No 44 - Erecting low-level bridge across the Campaspe, between Ferguson’s selection and Robertson’s P.R., Parish of Campaspe’. Plans and specifications were available for inspection at the Shire Hall in Rushworth, and O’Brien’s Hotel at Runnymede. The notation ‘Robertson’s P.R.’ is a reference to the Pre-emptive Right (homestead site) of Robertson’s earlier squatting run, known as ‘Campaspie River’, originally a sheep station of 48,000 acres situated to the east of Goornong. The property of James Robertson in 1846, Campaspie River station passed into the hands of Thomas Robertson of Clare Inn in 1854, the squatting rights being cancelled in July 1875. Thomas Robertson appears to have moved his centre of activities from that early Pre-emptive Right to another Campaspe crossing place associated with his Clare Inn and its early bridge, at what is now known as Barnadown (previously simply known as Clare Inn). This strategic move presumably capitalised on the grog trade associated with the abundant gold-rush traffic on that earlier route between Rushworth and Bendigo, a little south of Ferguson’s crossing, and the Campaspie River squatting run’s Pre-emptive Right. When a squatter acquired a sheep station’s Pre-emptive Right or homestead site from the Crown, it made sense to have both a good river frontage and access to a convenient crossing place for livestock and horse vehicles. The current Ferguson’s crossing place is therefore associated with an early centre of grazing activities in the area, which predated the busy goldrush road system further south, and the old ford at Ferguson’s crossing was presumably part of a very early overland route in the Campaspe pastoral district. We know nothing about the small selector who gave the Scottish name of ‘Ferguson’ to the crossing and its original timber bridge. It appears to be coincidence that John Steel Ferguson was President of Waranga Shire in 1881, when the original Ferguson’s Bridge was built. This farmer-councillor had been an early settler at Tooleen a considerable distance to the south-east of Ferguson’s crossing, farming land on the former Mt Pleasant squatting run. As Shire President, J. S. Ferguson was obviously involved in the move to build the first low-level bridge at Ferguson’s crossing, however, he probably had more of a personal interest in another Campaspe River Bridge constructed a few months earlier. This was the low-level timber bridge which still exists further downstream at Fosterville, and today is known as Russell’s Bridge (known in 1881 as Meissen’s Crossing at Muskerry). There is no direct evidence to link the Shire President directly with the farm that gave its name to Ferguson’s Crossing, though there may possibly be a link. The current all-timber Russell’s Bridge, now out of use, provides our best guide as to what the original low-level timber bridge at Ferguson’s Crossing would have looked like, prior to its replacement by the current timber and steel structure in 1939. Farmers on the western borders of Waranga Shire had a common interest in getting bridges across the Campaspe River (their shire boundary), to provide convenient access to railways radiating out of Bendigo, as well as to access populous goldfields markets. Unfortunately, shires to the west of the Campaspe did not share this enthusiasm, and were often miserly in their contributions to Campaspe River bridges. The Waranga Shire had in 1880 obtained State financial subsidies to build Meissen’s (Russell’s) Bridge to the south of Clare Inn crossing, which implies that what is now an obscure back road was then regarded as a Main Road by the Public Works Department. Victoria’s Public Works Department received correspondence from Waranga Shire dated 10 October, 1881, requesting a £200 subsidy towards ‘bridge over the Campaspe at Ferguson’s’. That this request for State subsidy succeeded, indicates that by 1881 the State’s roads and bridges authority acknowledged this more northerly route between Rushworth-Colbinabbin and Bendigo to be of ‘Main Road’ status. Parliamentary Papers duly acknowledged this State grant ‘to assist the Waranga Shire in erecting a bridge over the Campaspe River at Ferguson’s. The Waranga Shire was to spend £250 on the bridge, in addition to the £200 of State subsidy. 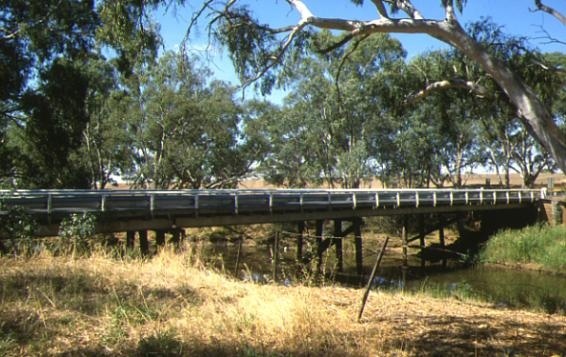 As in the case of Meissen’s Crossing, Huntly Shire across the Campaspe would contribute nothing to this shire-boundary bridge at Ferguson’s Crossing. Further correspondence between Waranga Shire and the Public Works Department indicates that payment vouchers for work on the original low-level Ferguson’s Bridge were being mailed during November 1881, suggesting that construction work was then well advanced at the site. 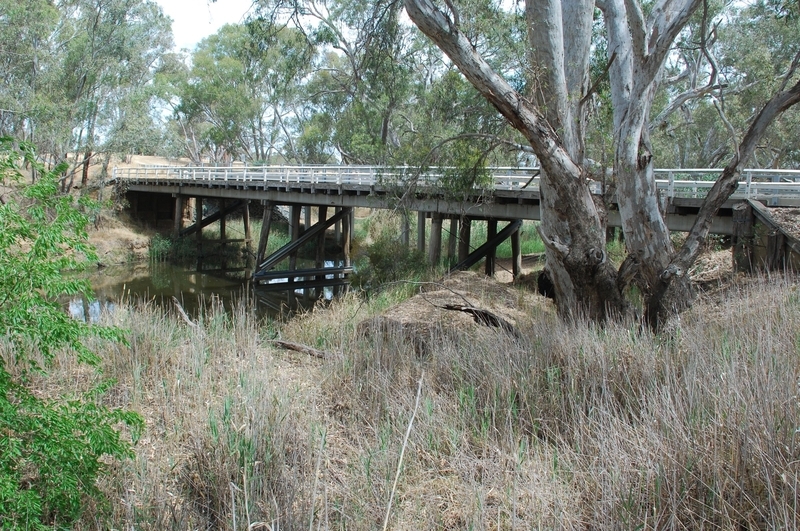 That original timber bridge at Ferguson’s Crossing served the route until 1939, when ‘a contract was let for the reconstruction of the old low-level timber bridge over the Campaspe River on the Goornong-Colbinabbin Road, known as Ferguson’s bridge...’. Country Roads Board engineers acknowledged that they were taking this opportunity ‘to improve the very poor alignment on the eastern approach to the bridge’. This reference makes it clear that the alignment of the original bridge, in relation to its road approaches, was modified in 1939. In an age of fast-moving motor vehicles, the acutely-angled approaches of the era of horse-drawn vehicles were no longer adequate to meet the needs of Main Road traffic. The concept of ‘super-elevation’ played an increasing role in road-making from the mid-1930s, with the outer edge of road pavements being raised to provide a banking effect at turns, discouraging fast-moving motor vehicles from disappearing into the trees at the roadside. ‘Super-elevation’ could also be applied to bridge construction by building curved decks that were gradually raised to the outer edge of the curve, thus discouraging fast-moving motor vehicles from disappearing into rivers. We do not know exactly when the technique was first applied to Victorian road-bridge construction. Ferguson’s Bridge is Victoria’s oldest surviving example of this type of curved and super-elevated design in a composite steel and timber road bridge, and it may well have been the first example of this type to be built in the state. Country Roads Board annual reports indicate that road works on ‘the Goornong-Colbinabbin Road’ were undertaken during 1939-1940 in conjunction with construction of the new Ferguson’s Bridge. In the financial year ending June 1939, there was ‘general maintenance of gravel road from Northern Highway to Ferguson’s bridge’, and in the next financial year there was reference to ‘priming and sealing with bitumen’ for 2.08 miles on this Huntly Shire section of the Goornong-Colbinabbin Road. The bridge must have been completed fairly quickly, before war-time conditions intervened to check all major road-bridge construction in Victoria. The CRB Annual Report for the financial year ending June 1940 recorded that: ‘on the Goornong-Colbinabbin Road approaches were constructed to the bridge over the Campaspe River and the alignment and grade of the eastern approach were greatly improved’. This curved CRB main road bridge, with its timber deck supported by rolled-steel joists, would successfully withstand a big accumulation of flood-borne timber debris in October 1949, when Country Roads Board officers photographed the flood-bound structure. Ferguson’s Bridge has now served Victoria’s motoring public for almost sixty years, which is in itself a tribute to CRB engineers who designed the structure. However, the super-elevated timber deck that was well-suited to the needs of motor traffic in the late 1930s and 1940s is now severely challenged by the dynamic impact of latter-day heavy articulated trucks hitting it at speed. Being situated in a spacious riverside road reservation, if it is finally de-commissioned for road traffic it might conveniently be by-passed and left to posterity as a fine example of timber-and-steel bridge engineering from the early era of motor transport. It occupies the site of an historical Campaspe River crossing place, adjacent to the Pre-emptive Right (homestead site) of Robertson's 'Campaspie River' squatting run in the earliest days of white settlement. In 1881 the early pioneers' ford was replaced by an all-timber low-level river bridge named Ferguson's Bridge, which in turn was replaced by the present 'modern' timber and steel structure in 1939. It is the best and oldest example of only two surviving curved and super-elevated composite timber and steel road bridges. It is a superior example amongst the handful of remaining early (pre Second World War) composite bridges of standard CRB design with rolled-seel-joists and timber-deck. It is one of the best of fewer than ten surviving road bridges with curved timber decks. The bridge has excellent potential to be interpreted as a part of Victoria's rich timber bridge heritage. Its composite superstructure and curved super-elevated deck are features that particularly demonstrate the trend away from horse-drawn to motor transport during the 1920s and 1930s, and the influence that this had on bridge design in Victoria. It is representative of the increasing flexibility of bridge design during the 1930s, when CRB engineers in particular built composite bridges, with each part of the structure utilising the most appropriate and economical materials, primarily timber and steel. The importance of a place or object in exhibiting good design or aesthetic characteristics and/or in exhibiting a richness, diversity or unusual integration of features. The gently curved approaches and curved super-elevated timber deck of this bridge are beautifully complemented by its setting amongst ancient river red gums. It is one of only a handful of major road bridges with curved timber decks in Victoria. The importance of a place or object in demonstrating or being associated with scientific or technical innovations or achievements. It was probably the first super-elevated curved deck timber-steel bridge to be built in Victoria and is the oldest and most outstanding surviving example of this type. The importance of a place or object in demonstrating social or cultural associations. As probably the first timber "super-elevated" curved bridge in Victoria, it is particularly demonstrative of the changes which were occurring in road traffic during the 1930s: from horse-drawn vehicles to faster and heavier motor vehicles. Consequently there was a radical redesign of bridge alignments away from the sharp approach angles common in early bridges that had been built perpendicular to the stream for the sake of ease and economy, to super-elevated and curved roads and skew aligned bridge superstructures. Any other matter which the Council considers relevant to the demonstration of cultural heritage significance. The significance of timber bridges in the landscape is important, given that they are, to at least some extent, hewn from and part of the natural environment. Timber bridges have been a widespread, even characteristic, part of the cultural landscape of rural Australia. The landscape 'type' in which this bridge is situated is the most common: an open farming landscape, with a remnant corridor of indigenous vegetation at the stream crossing. Timber bridges are disappearing from this type of setting extremely rapidly, and good examples, that are both "exceptional" and "representative" of the general type, need to be identified and preserved. The river-bank context of this bridge is of high quality, featuring large river red gums. No permit is required for works to the new bridge (constructed in 2000) provided such works do not increase the footprint of that part of the new bridge which lies on registered land and provided such works do not damage the 1939 bridge.